The weather is finally warming up here in Utah, and for an outdoorsy-but-cold-hating person like myself, that means things are finally looking up in the world! I’ve already busted out my gear and gone on some hikes, but I’ve got a lot more planned for this summer. 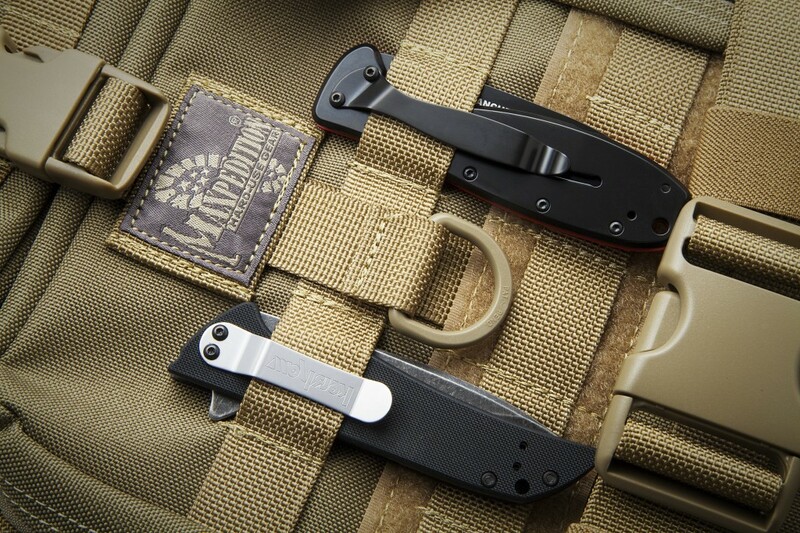 Since it’s getting to be that time of year, today we’re talking hiking and backpacking—knife style. 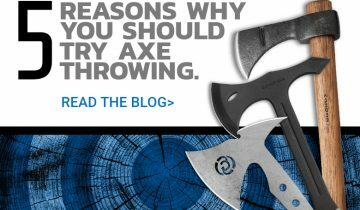 Here are some things to consider when selecting the ideal knife. 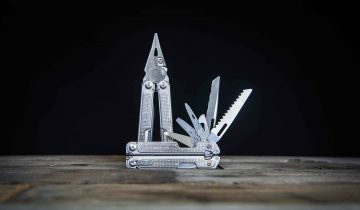 Often you’ll want a small, light knife when you’re hiking or backpacking, but ultimately the size and weight depends on what you prefer and are comfortable with. Some people really count the ounces and prefer ultralight knives and gear to cut down on the weight they have to carry. For other people, weight isn’t as much of a concern—perhaps they don’t mind moving a bit slower, or maybe they’re not carrying much with them so they can afford to bring a larger, heavier knife. If you’re going on a short hike or a backpacking trip that won’t demand much knife-wise, a folder might fit the bill. I went on a backpacking trip last summer in an area that was so hot and dry that fires were prohibited. We used our camp stove to cook our pre-packaged food and it was also a pretty popular destination, so for that trip, a rugged folding knife was perfect. A smaller fixed blade would have done well for us too, though. 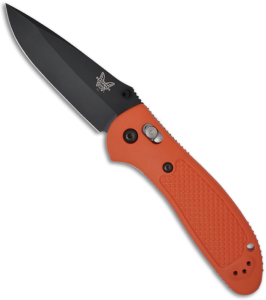 However, if you can only bring one knife, or if you’ll need your knife to do any heavier chores or food prep, you might want a fixed blade with a full tang. 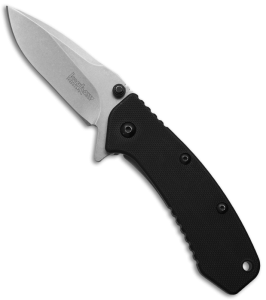 A knife with a full tang is typically more dependable than a folding knife, and that is a definite plus. No matter what knife you choose, it’s always nice to bring a knife that has zero to no field maintenance required. 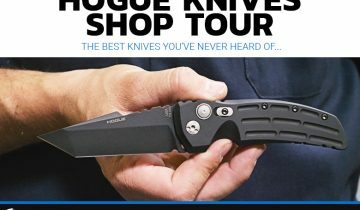 It’s better to bring a knife than to not bring a knife, and if you’ve got the space available, a fixed blade will typically be able to take more abuse than a folding knife. Unexpected things happen all the time on hikes, camping trips, backpacking trips, etc., so do your part to make sure you’ve adequately prepared for wherever you’re going. Even bringing along simple things like a knife, a compass, and a lighter can go a long way when you’re faced with a survival situation. The Bushcraft is a no nonsense, staight-forward design. 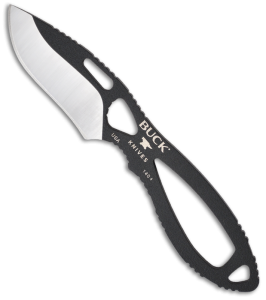 It’s got solid performance, a drop point blade with a full flat grind, and thick, tough construction. The Micarta on the handle works great and gets grippier if your hands are wet or sweaty. 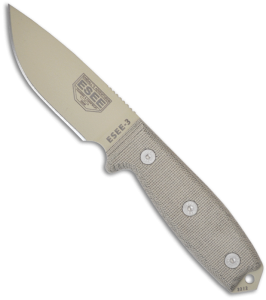 The ESEE-3 is a tried-and-true classic. 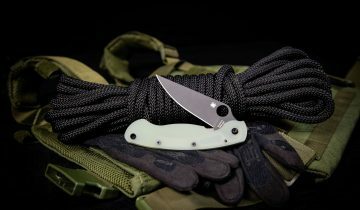 ESEE has a great heat treat, so you wouldn’t need to worry about sharpening any ESEE knife (not just this one) as much as you would with many other knives. It also takes a great edge, and the full flat grind cuts super cleanly. The DPx H.E.S.T. 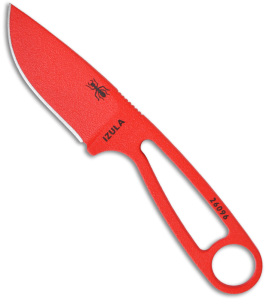 is bigger than the Izula without being too big, and it can handle larger tasks. The Eskabar is solid and is a mix of an ESEE Izula and a Becker Necker. It can be easily customized with paracord, and it has a great blade shape and thickness. It is extremely reliable and tough, and you can use it for light batoning (size limits). 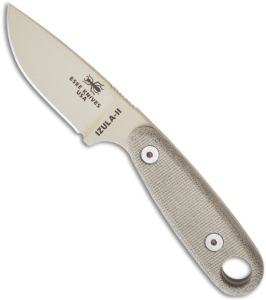 The Izula II is half an inch longer than the original Izula and it has Micarta handle scales. Like the Eskabar, it also has a great blade shape and thickness, and it’s reliable, tough, and can be used for light batoning (with size limits). 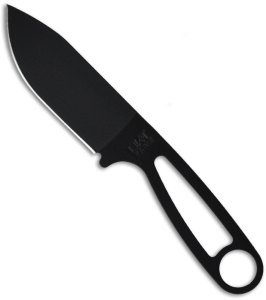 The skinner can be used to complement any hunting knife, but it’s also a great lightweight knife to carry on its own. It has a similar minimalist deisgn to the Izula, but it’s slightly longer than the original Izula. It has notches for gripping and a nice palm swell, and it is lightweight, slim, and strong. The Izula is an obvious choice for hiking or backpacking because it’s lightweight but still super tough. You can easily wrap it with paracord, or if you want some handle scales, you can purchase them and put them on yourself, or you can always go with the good old Izula II. 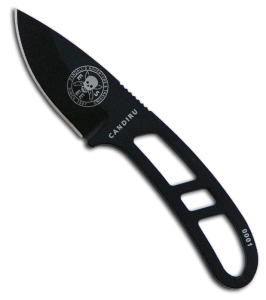 The Candiru is even smaller and lighter than the Izula for those extreme lightweight packers, but it’s extremely tough for its size. This knife weighs in at 0.53 ounces. It’s not a rugged knife by any means, but if your primary concern is getting a knife that’s lightweight, it’s a great way to go. 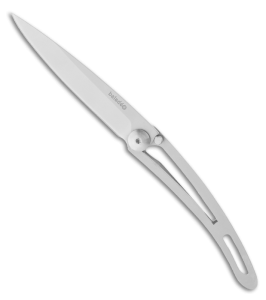 It has a sharp edge, a minimalist handle, and a solid locking mechanism. The Skyline works especially well for food prep; it has really good slicing action. 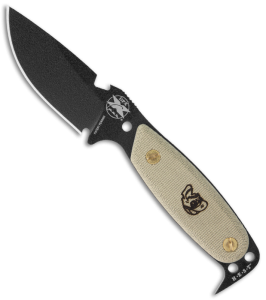 The Manix has a solid lock, and it will hold up very well as a lightweight folder. It’s also an excellent slicer with a full-flat grind, and it has a very good stainless steel blade. 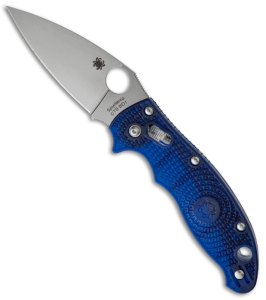 The Manix is great for a range of tasks, but not prying. 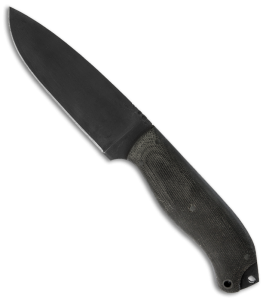 The Zancudo has a nice size and weight, is designed by ESEE, and has the awesome Laser Strike blade shape. It’s one of the best budget folders around right now. 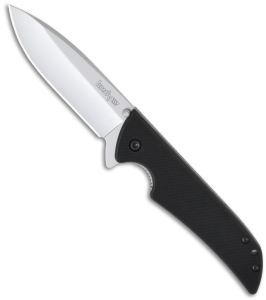 The Cryo gives you a great bang for your buck and works great when you just need a folding knife. You can’t go wrong with a Benchmade folder and the legendary Axis lock. 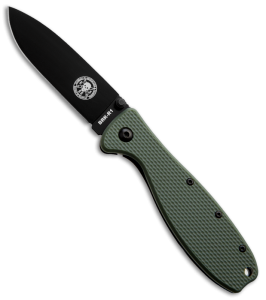 What’s your knife of choice for hiking or backpacking?